A Focus on Fundraising Using Laser Engraved Bricks - Laser Impressions Inc.
Fundraising gives life to many important projects and honoring donors for their contributions to those projects is vital. Donors like to know that their donations are appreciated and valuable to the organization that they support but not all fundraising activities are able to confer that strong sense of gratitude. If your organization is looking for a fundraising activity that will be able to raise much needed funds while simultaneously displaying a profound appreciation to donors, consider doing a campaign to install laser engraved bricks, tiles, or benches. One of the biggest perks of a fundraising activity that involves laser engraving is that the final product will last a lifetime. A fundraiser that commemorates donors using laser engraving is relatively simple and straightforward to execute. It’s easy to get potential donors excited about donating to the organization because they know that their involvement will be prominently displayed. 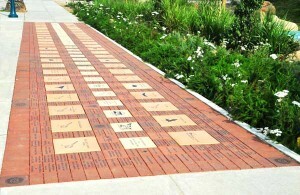 Laser engraved brick or tile displays of donor names gives a distinctive appearance to any building or structure. Fundraising efforts, however, may involve more creative displays of images or artwork however. Laser engraving is a versatile process and displays can incorporate clip art or even original art displays. The image possibilities are truly endless because lasers are used to melt the clay of the brick into any desired marking imaginable. The creative possibilities that are available through the use of this medium make it possible to develop inspired campaign efforts. Children’s drawings can be displayed on the bricks or a pattern can be created using an array of bricks that showcases a larger images made up of smaller units. A diversity of possibilities exist and fundraising campaigns can be designed to get potential donors excited about the final appearance of the display. Once the laser engraved pieces have been installed, they will not weather or lose their original, pristine appearance. Laser engraved bricks and tiles are maintenance free and environmentally friendly. The laser engraving process creates a a smooth etching into the brick or tile that is permanently adhered to the surface without the use of epoxy resins or other environmentally hazardous materials. The process is simple and the results are striking. Laser engraving can be incorporated onto materials such as bricks, tiles, boulders, book spines, plaques, or even benches. Fundraising organizations are encouraged to plan multiple campaigns to sell donor space on laser engraved items because once the first set of engraved materials displaying donor names have been installed, the fundraising process gets much easier. New potential donors will be able to see the final result and become more motivated to get involved. As a result of the sophisticated image conveyed by existing laser engraved pieces the fundraising process will become much easier over time. As the display turns into an aesthetically pleasing and entertaining presence it will eventually grow to represent your organization’s commitment to honoring and commemorating its donors as well as the important project that was funded by the donors on display. If you have questions about using laser engraved bricks for your organization’s next fundraiser, please call (888) 344-LASER to speak with one of our fundraising campaign experts. Alternatively, you may send us an email via our contact form. We are a non-profit from Massachusetts (Cape Cod) a local company recommended your services, they did a brick campaign and were happy with it. could you tell me how it works since you are in CA?